It may be Thanksgiving, but my mouth was asking for peanut butter cookies, not pecan or pumpkin pie. 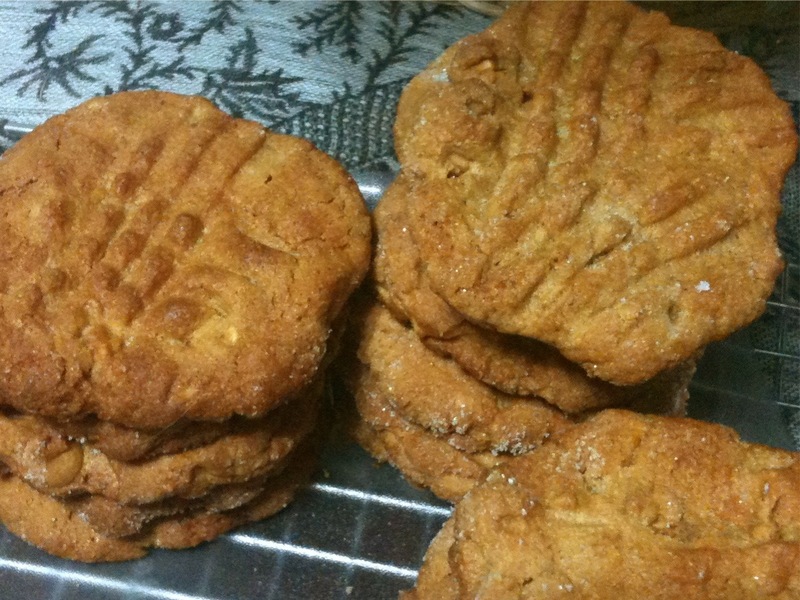 It’s been a while (years) since I made peanut butter cookies, and the only thing I was certain of was that I would use crunchy peanut butter and Reese’s chips. Poking around the intertubes, I discovered flourless cookies. Sounded like just the ticket! Crisp and wonderfully peanut-y! Some people flatten the cookies with the bottom of a glass; I pressed with a fork, cross-ways. Whether you use a glass or fork, dip in the granulated sugar regularly or the utensil will stick to the cookie dough! Bake for approximately 10 minutes. The cookies should not be browning or appear crisp. Cool on wire rack. * If you use a “sweet” peanut butter, you might want to reduce the sugar. I used an organic peanut butter that’s not very sweet, but it wasn’t a “natural” peanut butter like Adams. ** For a variation, consider Ghirardelli’s semi-sweet chips, solo or co-mingled.